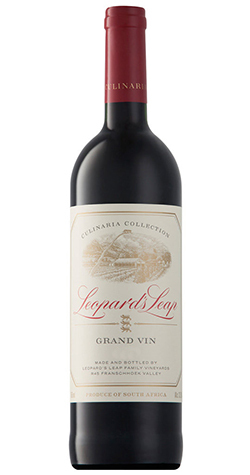 This elegant blend with Bordeaux-style blend with complex layers. Aromas of black currant and mulberry, perfectly integrated with oak spices and a hint of cinnamon and tabacco. This elegant blend of Grand Vin is a Bordeaux-style blend with complex layers. Aromas of black currant and mulberry, perfectly integrated with oak spices and a hint of cinnamon and tabacco. The ripe tannins ensure a firm, elegant structure. Grapes were hand-picked and hand-sorted. The varieties were harvested separately at optimal ripeness and at an average of 25 degrees Balling. Each variety was fermented separately at between 25 and 27 degrees Celsius. During wine-making there was minimal intervention, with regular punch-downs and pump-overs, for extraction of colour and flavour. Just before the end of fermentation the grapes were pressed and fermentation was completed in 225-litre French oak barrels. 50% of fermentation took place in first-fill French oak barrels, and the remaining in second-and third-fill barrels. The components were kept separately for 12 months. Thereafter, blending took place and the wine was returned to the barrels for a further 10 months to ensure optimal integration of the different components.